What is a Turf Toe Injury? For this reason, it often occurs in athletes, particularly football players, ballerinas, gymnasts, soccer players, and basketball players. Turf toe occurs when the ligaments surrounding the big toe joint are sprained. The big toe joint works like a hinge, allowing the toe to move up and down. Behind the big toe joint, there are two bones called sesamoids located in the ball of the foot. The sesamoids act as a pulley for the tendons. They provide leverage and shock absorption. Every time you take a step, you begin a gait cycle that includes lifting your heel and placing your body weight onto the ball of your foot. You then push off the ground using your big toe, and shift your weight to your other foot. Sometimes, the toe doesn’t push off the ground properly, and can become injured. If the toe stays flat when you push off the ground, such as if you were tackled or fell forward, the toe is hyperextended. When the toe is hyperextended repeatedly or suddenly, the ligaments surrounding the joint can be sprained. A turf toe injury often occurs suddenly. It is called turf toe because it often occurs to athletes who play on artificial turf surfaces, which tend to be harder than other surfaces. It can occur on many other types of surfaces as well, particularly if the person is wearing shoes that do not provide adequate support. This is particularly true of soccer shoes, which tend to be flexible and stick in the grass. 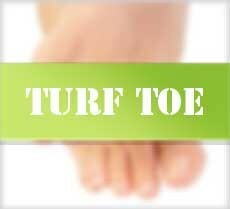 A turf toe injury causes pain, swelling, and limited ability to move the big toe joint. When turf toe is caused by an acute injury, the pain may occur instantly and get worse over the next day. You might feel a popping sensation at the time of the injury. A turf toe injury can also be a repetitive injury, in which case the pain will begin slowly and gradually get worse over time. If you have turf toe, you should rest the joint and try to protect it from further injury. This approach is referred to as RICE, which means rest, ice, compression, elevation. Your doctor might tape or even cast the toe to immobilize it. You may need to use crutches temporarily so that the toe is not bearing any weight. Turf toe injuries typically take several weeks to heal. If you have turf toe, the odds are good that your feet haven’t been receiving adequate support, which allowed the turf toe injury to occur. You can prevent recurrence of turf toe by wearing supportive footwear. Your shoes should prevent the toe from hyperextending when you step off from the ground. Sometimes, shoes alone are not able to provide sufficient support. You may benefit from specialized shoe inserts that give you extra protection. Talk to your podiatrist or shoe fitting specialist about how you can correct your gait and support your feet through the use of footwear and custom arch supports or orthotics. If you have experienced a turf toe injury, visit Foot Solutions UK. Our specialists will assess your gait and make recommendations for you as to the best footwear and custom arch supports to help protect your feet and avoid recurrence of turf toe. Visit Foot Solutions UK today.